The fine rendering of the subject through the photographic process is fundamental. Almost innocuous arrangements of materials are heightened merely thorough being photographed. The use of elevated vantage points sometimes places the viewer in the canopy and often provides a taunting glimpse of something beyond or through the maze. 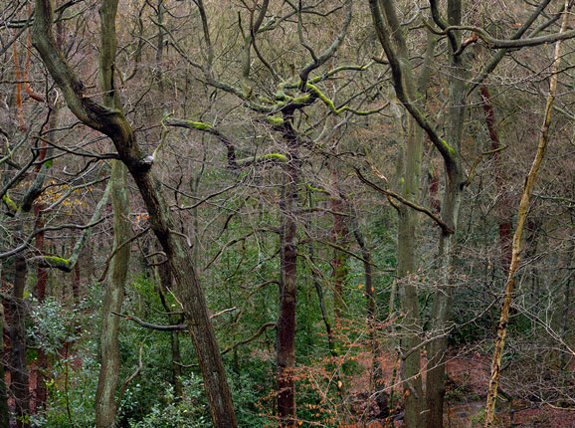 I started this work in the “wilds” of Derbyshire, but got increasingly drawn back to the city’s edges, its green, unmanaged areas on the urban borderline. The images appear to re-present the forces of “pure nature,” yet they are all “post-industrial landscapes” in one way or another.